Settled prior to 100 AD by Polynesians, the islands were given their name buy the Spanish explorer Álvaro de Mendaña de Neira, who reached them in 1595. The islands once were inhabited by over 80,000 people before smallpox carried by European explorers ravaged the population. The Marquesas Islands are now home to a modest population that acts as custodian to its unique culture. The Marquesans are said to be among the finest craftsmen throughout French Polynesia. They create large and fine carvings, beautiful tattoos, surprising pieces of jewelry. While family-run pensions can be found on most of the fifteen islands making up this portion of French Polynesia, most tourism is centered around the administrative capital located on Nuku Hiva and the island of Hiva Oa. The largest archipelago among the Marquesas Islands, Nuku Hiva offers a lush landscape consisting of spectacular waterfalls and dramatic cliffs descending into the Pacific Ocean. The landscape is frequented with ancient ruins, majestic statues and places of worship constructed by the unique Marquesas culture. Extraordinary landscapes, an incredible archeological history, great stories, and a rich culture alongside a friendly population are all waiting to be discovered. According to legend, Hiva oa is the main beam of Gods’ “big house.” Today, it is commonly named the “Garden of the Marquesas” thanks to its fertile and lush land. The island features endless untouched nature: green, invading and bright. Roads and houses are rarely seen. The island’s rugged landscapes blend sharp ridges, peaks and valleys scattered with archeological sites and ruins. They are home to the largest tiki statues of French Polynesia. 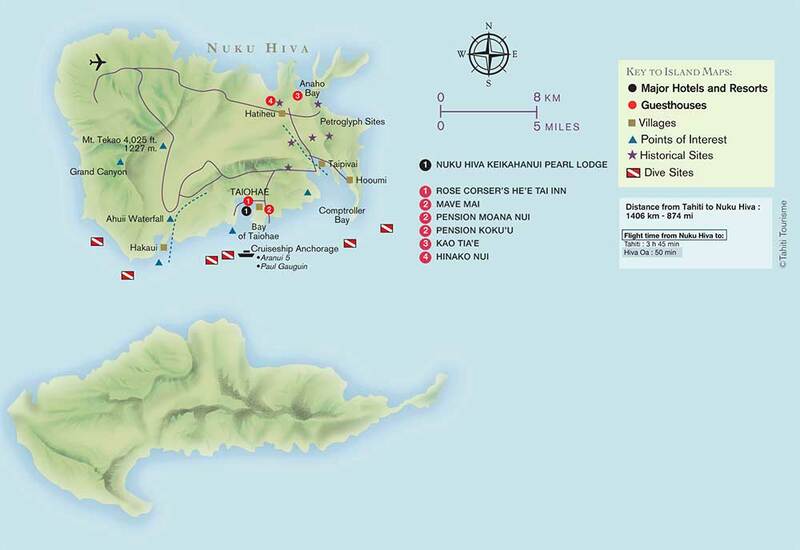 Hiva oa is lined with black sand beaches and sharp cliffs diving into the Pacific Ocean. The island’s main village, Atuona, is nested at the end of Taaao Bay and is overlooked by the highest mountains (Mount Temetiu – 4,186 ft. and Mount fe’ani – 3,366 ft.). This is also the place where two famous artists chose to live their lives: the french painter Paul Gaugin and the French poet, singer and actor Jacques Brel. Visitors have long been mesmerized by Fatu Hiva. In 1937, Thor Heyerdahl and his wife, in quest of a genuine return to nature, set foot on the island to live as was done at the dawn of the new world. Not much has changed. Today, most local people live around the village of Omoa where they make traditional and renowned tapa out of tree bark. Hanavave is sheltered within an amazing bay: the Bay of the Virgins, probably one of the most beautiful bays on Earth, especially at dusk when the light blazes the volcanic peaks turning the landscape into an unreal and unforgettable scene. Tahuata is accessed only be by sea from Hiva oa. The island offers charming discoveries to the privileged traveler. From its fertile valleys to its crystal clear bays, Tahuata is an exquisite haven of peace, a place of history and creativity. Most inhabitants make a living out of their remarkable fine artwork, such as bone and rosewood – or miro (Thespesia populnea) carving. Mono’i is made following the scents of traditions and secrets, like an invite to a mesmerizing perfume beautifully named “love potion” by the islanders. Ua Huka presents more untouched beauty and is renowned for its dry soil and landscapes. Wild horses gallop as far as the eye can see around this desert-colored land. Goats climb up on the island’s high plains. Peaceful and mystical, Ua Huka invites the traveler to discover a secluded universe, where the island’s ancestors are not just a part of the past but still very much part of the islanders’ everyday life. Ua pou symbolizes the entrance pillars to God’s house. Huge basaltic columns reaching the sky and holding the names of legendary warriors: Poutetaunui and Poumaka. In 1888, they inspired poet Robert Louis Stevenson, who mentioned them as “volcanic arrows looking like a church bell tower.” They proudly overlook the bay of Hakahau village, the main village on the island.